Experience the full range of Oahu's amazing hidden secrets, the way they should be seen. Beyond the modern metropolis of Honoluluu's world-class shopping and dining, Oahu's breathtaking scenery awaits. On this 60-minute Oahu-Complete Island tour, you'll see it all - Diamond Head's extinct volcanic crater, the pristine coral reefs of Kaneohe Bay, the landmark of Chinaman's Hat, the "Jurassic Park"-like cliffs of the Nuuanu Rainforest, the breathtaking North Shore and Sacred Falls, the panoramic Dole Plantation, and of course the unmatched power and emotion of Pearl Harbor and the Arizona Memorial. Plus, on this tour you'll also view the 4000 foot Waianae mountain range and the rustic Leeward Coast - home to the luxurious Ko Olina resort area, Makaha Beach (where big wave surfing began), and Yokohama Bay. Aircraft: American Eurocopter EC130 "Eco-Star: Every seat offers greater personal space, first-class individual seats, and expansive glass for exceptional visibility. This is the world's newest and most expensive model of touring helicopter, and the first specifically designed for air tours. For each guest weighing 250 pounds or more, an adjacent, empty seat purchase is required to safely balance the aircraft. The charge for an adjacent empty seat is reduced to 50% off of the retail tour price. This additional charge will be paid upon check-in. A string-of-pearls full of stunning sights: Picturesque Honolulu Harbor, graced by the renowned Aloha Tower; downtown Honolulu and Iolani Palace, the only royal palace in America; heart-tugging Punchbowl, the National Memorial Cemetery of the Pacific; Magic Island, Ala Moana Beach Park, the legendary vistas of Waikiki Beach and Diamond Head, and the unforgettable emotion of Pearl Harbor and the Arizona Memorial. Pali Makani (30 minute tour) - A string-of-pearls full of stunning sights: Picturesque Honolulu Harbor, graced by the renowned Aloha Tower; downtown Honolulu and Iolani Palace, the only royal palace in America; heart-tugging Punchbowl, the National Memorial Cemetery of the Pacific; Magic Island, Ala Moana Beach Park, the legendary vistas of Waikiki Beach and Diamond Head, and the unforgettable emotion of Pearl Harbor and the Arizona Memorial. Ko'Olina means "Place of Joy" in the Hawaiian language. This"Oahu Spectacular" flight departs from this beautiful, legendary resort area and brings you all the visual joys of Oahu in one phenomenal tour. You'll experience the legendary vistas of Waikiki Beach, Diamond Head's extinct volcanic crater, the pristine coral reefs of Kaneohe Bay, the landmark of Chinaman's Hat, the "Jurassic Park"-like cliffs of the Nuuanu Rainforest, the breathtaking North Shore and Sacred Falls, the panoramic Dole Plantation, and the unmatched power and emotion of Pearl Harbor and the Arizona Memorial. Unforgettable. . Location: Ko Olina 92-100 Waipahe Pl, Kapolei, Click here for directions. This is more of an adventure ride than a tour, a sensory rush with the wind in your hair. Guests fly in the same helicopter used in the Magnum P.I. television series. The tour route is the same as the Hidden Oahu tour and every seat has an excellent view, unobstructed by doors. This is the preferred method of flying for serious photographers as you don't have to shoot through Plexiglas. Open Seating passengers weighing in excess of 250 pounds may be charged an additional fee equal to one-half the cost of one seat. Open Seating passengers weighing more than 300 pounds will be charged for an additional seat. Any two Open Seating passengers from the same reservation whose combined weight exceeds 430 pounds may be required to purchase a comfort seat. An individual First Class passengers weight must not exceed 180 pounds; the combined weight of two First Class passengers must not exceed 345 pounds. A portable lifting device is available for those customers needing special assistance. Please advise us in advance of any special requirements. This all-encompassing tour lead by a tour guide whose knowledge and love of the island will leave you wishing you had time for more! It's a great value including any required admission fees and well make sure you get lunch! 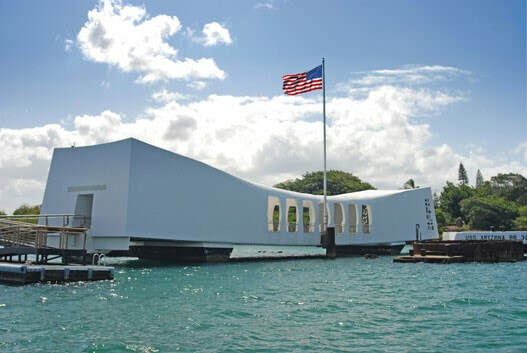 Begin at sunrise as you head out to re-live a striking historical moment in time at the World War II Valor in the Pacific Monument and USS Arizona Memorial. In this quietly moving place, you experience the history, tragedy, and heroism of the attack that propelled the U.S. into World War II. Take a boat ride out to the 184 USS Arizona Memorial structure that actually spans the mid-portion of the battleship itself as it rests on the harbor floor. The day's journey begins in earnest. After passing through the center of Oahu and alongside Wheeler Airfield, one of the first targeted objectives of the Japanese naval attack, you head toward the North Shore. The famous Dole Plantation provides a refreshing stop. Feed the koi fish in the plantation fish pond or grab a sweet frozen pineapple DoleWhip . Catch the laid-back local rhythm of the North Shore as you pass through the small towns with just the right mix of surfing culture and country island-style. The shoreline's famous names come to life as your guide shares fascinating local facts and tales. Time to stretch your legs and discover where old Laie comes to life! The Hukilau Marketplace is a vintage throwback to 1950's Hawaii where nostalgic foods, handmade goods and friendly locals give you a taste of the North Shores good ole' days. Enjoy a COMPLIMENTARY LUNCH BUFFET on us at the Hale Aloha OR wander the Marketplace and make your own choices amongst the varied island delights. Turning towards the majestic power of the islands lush and rugged mountain range, you rise up to the final battlefield where King Kamehameha fought to unify the Hawaiian Islands. Standing high on the windswept Nu'uanu Pali cliffs, you can feel its wild and tragic history, an ancient parallel to the morning's Pearl Harbor stories of bravery in the face of conflict. Waimanalo. Sherwood Forest. Makapuu. Sandy Beach. These are the bodysurfing playgrounds that draw locals from all around the island. Beware. It is not as easy as it looks! Seabirds soar above the islands windswept coastline where ancient lava fields descend into the sea. Halona blowhole, a natural underground lava tube, funnels plumes of ocean water into the sky in syncopation with the sea. Hanauma Bay hovers on the eastern tip of the island-home to a living coral reef and safe haven for fish and marine animals. Early afternoon will find you turning back towards Honolulu, cruising around the slopes of Diamond Head, Hawaiis most famous landmark. Don't forget your camera for photo opportunities galore. The young and young-at-heart will be entertained by island folklore and history shared by your tour guide throughout the day. This is the complete island experience for the whole family. Security restrictions at Pearl Harbor will be enforced. Please do not bring large bags or anything that could offer concealment. Storage is available at Pearl Harbor for $4.00. It's early morning, and as you head towards Honolulu's infamous Pearl Harbor, your guide provides significant island history and background on what you will see. Exhibits and artifacts at the Pacific Historic Parks Pearl Harbor Visitor Center set the scene, vividly depicting the events of December 1941. Next, you head by boat to the USS Arizona Memorial, where visitors from around the world pause to reflect; looking down on the ruins of the sunken WWII battleship. Aboard the nearby USS Missouri you learn about Mighty Mo's wartime history and see a signed copy of the surrender document that ended the war. Don't miss the USS Oklahoma Memorial, a monument to those who lost their lives in the attack on Pearl Harbor. Your guide takes you through downtown Honolulu and past the historic buildings that were a part of Hawaii's history as a monarchy, a territory, and as the 50th state. A drive through Punchbowl Crater, home of the National Cemetery of the Pacific, completes this tour. Here, 38,000 markers pay tribute to the men and women of the US Armed Forces who have sacrificed for their country. Throughout the day, your guide shares insightful details about the beautiful island's place in history. Experience this memorial tour and you will find a new appreciation for O'ahu and it extraordinary past. Take in the top attractions on Oahu in one incredible day. Historical Pearl Harbor and the fascinating music, dance and people of the Pacific featured at the Polynesian Cultural Center. Due to ceremonies honoring the attacks of December 7, 1941, we will not operate tours to Pearl Harbor and the USS Arizona Memorial on December 7. Kayaking in Hawaii is world renowned with warm waters year-round and, there is no better place than Kailua Bay. Oahus favorite beach town offers miles of white sand and six different protected offshore islands make for an ideal location for your kayak trip. The Day starts when you are picked up from Waikiki, usually between 8:00 and 9:00 in the morning. At the kayak shop you will be outfitted with all of the necessary gear for the trip including life-jackets, lockers, dry bags etc. You will be given a thorough briefing of the area and some basic instruction by an eco-guide. Set out for two hours of kayaking and adventure. Arrive at the shop for lunch,have a hot meal and set out again, armed with snorkel gear or boogie boards, you decide. Use the shower facilities and change into some dry clothing and a driver will have you back in your hotel by around 3:30. All the kayaking gear, including PFDs, paddles, backrests, drybags. The day starts with hotel pick you up from Waikiki, between 8:00 and 9:00 AM or check into our shop at 9:15 for those with transportation. You will be introduced to your kayak guide and naturalist and outfitted with all of the necessary gear for the trip including life-jackets (PFDs), lockers, dry bags and snorkel gear. You will be given a thorough briefing of the area, some basic instruction on kayaking and the days schedule. Kayakers then walk the kayaks to the beach on carts (about 5 minutes) and set out for the Mokulua Island sea-bird sanctuaries, about an hour paddle one-way. Upon landing on the islands deserted beach, embark on an eco-tour and tide-pool hike to Queens Bath. Next, paddle across Lanikai Beachs turquoise waters, go snorkeling and enjoy a hand made deli sandwich, complete with fruit, drinks and healthy snacks. Guests will have a chance to kayak surf, explore the beaches or go for a swim. Arrive at our shop around 2:30 pm, use our shower facilities and change into some dry clothing. You will be on your way by 3:00 pm, or our driver will have you back to your hotel by around 3:30pm. Our Beach Center Shop carries all accessories like sunscreen, UV-shirts and waterproof cameras. The day starts with hotel pick you up from Waikiki, between 8:00 and 9:00 AM or check into our shop at 9:15 for those with transportation. Arriving at the kayak shop, you will be outfitted with all of the necessary gear for the trip including life-jackets, lockers, snorkel gear and dry bags (Included). You will be given a thorough briefing of the area and recommendations will be made for your trip. The Beach Center Shop carries any necessary accessories like sunscreen, Croakies and waterproof cameras. Set out for up to four hours of kayaking to the offshore islands and beaches of your choice, snorkel and look for sea-turtles. Lunch is included with several options of meat and vegetarian, hand-tossed pizzas, calzones, burgers, salads, and Korean BBQ, sodas and juice. Use shower facilities and change into some fresh clothing and a driver will have you back in your Waikiki hotel by around 3:30. Kayaking is a physical activity that does require moderate strength. From Waikiki, a professional nature guide will shuttle you by van to Windward O'ahu where guests will enjoy a rainforest hike to a hidden waterfall against the Ko'olau Mountains. This 1.5 hour moderate rainforest hike is 2 miles round-trip. The trail is a dirt and stone trail that can be muddy and slippery when wet. Once you reach the falls, enjoy the opportunity to cool off by splashing in the refreshingly cool waterfall. Beautiful elevated views can be seen from this mountainous perch. You will then be shuttled to the stunning scenery of Kualoa beachfront where you'll be outfitted with a single or tandem kayak with paddles, life jacket, dry bag and instruction. Just a quick 30-minute paddle and you'll be at China Man's Hat (Mokoli'i Island). You are welcome to snorkel, relax or explore the island on foot. Return to the starting point where you'll rinse off with fresh water showers before returning to Waikiki by van. Total activity: 1.5 hours of hiking, 1.5 hours of paddling, and 30-minutes of complimentary snorkeling (visibility permitting). Participants must wear life jackets during paddle/snorkel. A tropical Mai Tai greeting and traditional Hawaiian music set the festive mood of the evening. Casually stroll through the Hawaiian Village and learn the Arts & Crafts of the islands or test your skills at our Hawaiian Games. After the delightful Shower of Flowers, participate in the Hukilau on the Beach and learn the net fishing techniques of old Hawaii. Witness the time-honored techniques of underground oven cooking at the Imu Ceremony. The evening continues with a feast in the company of friends, old and new. Bring your appetite to fully enjoy the extensive menu which tastefully blends the best of traditional Hawaiian dishes, local favorites and continental cuisine. With the most spectacular Hawaiian sunset as a backdrop, the award-winning performers will entertain and amaze you with an unforgettable display of songs and dances of Hawaii and Polynesia. Deluxe Luau: All of the above plus, $24/Adult, $18/Youth & Child Cove Card*, Deluxe Seating - Front of Stage, Hawaiian Luau Menu, Table Service (versus buffet), Souvenir Arrival Photo (one per person), Souvenir Gift from Paradise Cove *The Cove Card may be used towards the purchase of beverages, merchandise in Marketplace & arrival/specialty photograph(s). It is valid only for the night of the Luau. Exclusions may apply. Entrance to the Waimea Valley botanical garden and water fall is Included with a Toa luau purchase. Guests can present their boking confirmation or vouchers at the ticketing office. Waimea Valley is open every day at 9am. The Valley offers a scenic paved path leading up to Waimea Falls at three quarters of a mile one way. While pace may differ for each visitor, the path can take anywhere from 15 to 40 minutes to complete one way. The path is also easily accessible to those who may have any physical mobility limitations. A golf cart shuttle is offered for the fee of 10$ per person for a trip up to the falls and back down. With a paved scenic path leading straight to the 45 ft. natural waterfall, Waimea Falls is one of the most accessible falls on Oahu. The falls measure about 40ft in height, splashing into a large pool available for visitors to swim in. Life jackets of all sizes are offered free of charge. Location: Waikiki and North Shore transportation is NOT available. Hawaii's Polynesian Cultural Center located in Laie, Oahu, about an hours scenic drive from Waikiki is the top paid Hawaii attraction and a must see Hawaii activity. Set against a backdrop of Polynesia, the ALI I LUAU is a Royal feast that includes traditional luau food (kalua pork, lomi salmon, poi and more...) and authentic Hawaiian entertainment. Meet, learn about and interact with the people of Hawaii, Samoa, Maori New Zealand (Aotearoa), Fiji, Tahiti, the Marquesas and Tonga, Watch Hawaii's only canoe pageant, Experience an authentic Hawaiian luau, a dinner-show feast fit for an alii (royal chief), Enjoy the world-famous evening show, HA - Breath of Life, Enjoy family activities from all of Polynesia, And much more! INCLUSIONS: A lei greeting, Admission to all the island nations of Polynesia - Samoa, Aotearoa (New Zealand), Fiji, Hawaii, the Marquesas, Tahiti, Tonga, the Rapa Nui (Easter Island) exhibit and the 1850s Mission Complex. Motorcoach transfer is a 54 passenger but that stops at central Waikiki locations. Mini coach transfer is a 25 passenger mini bus that stops at most Waikiki locations. Hawaiis largest, award-winning 1,500-passenger tour vessel with 3 types of stabilizers for smooth sailing in Hawaiian waters; Hawaiis only A.D.A. compliant ship featuring 4 spacious decks and 6 dining rooms for the best views and most choices. Departs daily from festive Aloha Tower , Pier 8. The options to choose from, Star, 3 Star and 5 Star. Add on the Celebration Plan to any package: Celebration Plan: Private table (window seating up to 8 persons, center seating 9 and above persons), photo (per 2 persons); minimum of 2 persons. Enjoy casual elegance with sirloin steak and all-you-can-eat crab dinner plus new My Hawaii Beyond the Reef show! After a welcome Mai Tai, explore four panoramic decks for breathtaking views of the Hawaiian sunset and coastline, and complete your evening with our new My Hawaii show and dancing! 3 Course Crab and Sirloin Steak Dinner includes Half Baby Romaine, Kamuela Vine Ripened Tomatoes and Sesame Star Puff Pastry with Papaya Seed Dressing. Main Entre of Steamed Snow Crab Legs and Sirloin Steak with Port Wine Sauce with Fresh Lemon, Clarified Butter and Citrus Ponzu, Homemade Mashed Potatoes, Sauted Fresh Vegetables and Hawaiis Favorite Macadamia Nut Ice Cream. Whole Loaf of Freshly Baked Poi Bread with Butter accompany dinner. Freshly Brewed STARs Custom Kona Blend Coffee and Tea are also served. Special Menus of Chicken, Fish or Vegan available with 24 hours notice. Beverage: One Star Signature Mai Tai is served. Additional premium beverages and the STARs special selection of vintage wine and champagne by the bottle available for purchase. A fun and exciting evening with whole Maine lobster and tenderloin steak dinner plus new show! Your voyage begins with a champagne toast, followed by continuous entertainment from welcome hula to live Jazz, new My Hawaii Beyond the Reef show by the largest cast on island waters and dancing. 5-Course Whole Maine Lobster and Tenderloin Steak Dinner includes Appetizer Bar of Imported and Domestic Cheeses with an Assortment of Gourmet Crackers and Fresh Tropical Fruits, Hawaiian Greens, Purple Endive, Baby Romaine and Grape Tomatoes with Passion Fruit Tarragon Vinaigrette, Steamed Whole Maine Lobster with Fresh Lemon, Clarified Butter and Citrus Ponzu, Fire Roasted Tenderloin Steak with Sweet Madeira Wine Sauce, Homemade Yukon and Purple Okinawan Mashed Potatoes, Sauted Fresh Seasonal Vegetables and Hawaiian Mango Mousse Cake with White Chocolate Garnish. Freshly Baked Furikake Lavosh and Sweet Butter Breadsticks with Butter accompany dinner. Freshly Brewed STARs Original Coffee and Tea are also served. Special Menus of Chicken, Fish or Vegan available with 24 hours notice. Beverage: Non-Alcoholic Champagne Toast and Two Premium Beverages are served. Additional beverages and the STARs special selection of vintage wine and champagne by the bottle available for purchase. Be pampered at the exclusive Captains welcome reception on the top deck, seasonally inspired 7-course French style dinner served to your own private table in our Art Deco Super Nova Room, super premium beverages and live Jazz entertainment by some of Oahus top artists! The Executive Chef and culinary team design a 7-Course French Style Dinner, a feast for the eyes as well as the palate. The menu changes quarterly to reflect the freshest and finest ingredients of the seasons. Includes assorted Seasonal Canaps at the Captains welcome reception, Soup, Admirals Salad, Live Maine Lobster entre, Sorbet Intermezzo, Prime Tenderloin of Beef entre and Chefs Special Dessert of the season. Freshly Baked French Bread and Brioche with Butter accompany dinner. Freshly Brewed STARs Original Coffee and Organic Teas are also served. Special Menus of Chicken, Fish or Vegan available with 24 hours notice. Beverages: Non-Alcoholic Hawaiian Bellini at Captains welcome reception, plus Three Beverages from our fine selection of Super Premium Liquors including After Dinner Drink Cart Service of international coffees, cordials, cognacs and liquors. The STARs special selection of vintage wine and champagne by the bottle (and glass for wines) available for purchase. Time: 5:30 7:30PM. Friday Fireworks & Sunset Cruise 5:30 - 8:30PM. Get ready for an incredible evening on a dinner cruise like no other. Escape the stuffy dining room and enjoy the open air on a sunset dinner sail with Makani Catamaran! As an amber glimmer of the setting sun reflects off the city skyline and the towering peak of Oahu's famed Diamond Head stands above the azure Pacific water, you'll be reminded why you came to Hawaii in the first place To discover the beauty of paradise! Featuring a delicious island-style menu, tasty tropical cocktails, indoor and outdoor seating, and a stunningly beautiful Hawaiian sunset, theres no better way to bring an end to a day in the tropics than on an evening sail with Makani! Veggie Spring Rolls, Roasted Red Potato Salad with hints of Olive Oil & Dijon, Macadamia Nut Chocolate Chip Cookies, 1 Complimentary Drink, alcoholic & non-alcoholic beverages available. Time: Winter (Sept. 1 Apr. 30): 5:00pm 7:00pm. Summer (May 1 Aug. 31): 5:30pm 7:30pm. This is the most popular sail for the fun loving crowd! All drinks are included so even strangers become fast friends on this one! Juice, soda, bottled water, wine, champagne, and a variety of domestic and premium local beers are provided, Margaritas and the famous Holokai cocktail. So sit back, relax and enjoy the magnificent sunset! An array of gourmet, fresh selections, a fusion of the best Hawaiian, Asia-Pacific and Continental-inspired dishes. Served buffet tapas style, so that you can mingle and enjoy the buffet how you want, where you want, and as much as you care to eat on a relaxed barefoot cruise. You have the best seat in the house for the Hilton fireworks display. Sides of shrimp cocktail, bread rolls, pita chips with feta cheese and basil pesto, and potato salad. Cream puffs and assorted mini cheesecakes for dessert. Location: Departs from Kewalo Basin, Transfers from Waikiki are included. Click here for directions. This cruise operates on Friday evenings only. Take a hiking trip along the slopes of an ancient cinder cone volcano and explore a lush native rainforest preserve offering sweeping views of Oahus two parallel mountain ranges. Soak in majestic tropical island views as you hike to a 600-foot elevation gain. This Hawaii rainforest hiking trip is rich in rare and endemic plant species, your guided 2.5 mile moderate hike will meander through a native forest as it captures distant scenic views of both the highest point of the volcanic Koolau Mountain range (Konahuanui at 3150 feet), the highest point of Oahu (Mt. Kaala at 4025 feet), Leahi (Diamond Head) volcano crater, Honolulu, Waikiki, Pearl Harbor, Kailua, and the shimmering Pacific Ocean. Above average fitness level required for this 2.5 mile one-way Hawaii volcano hike. Sturdy shoes with good traction on dirt and rainforest mud is a must. Guests should wear their own shoes suitable for hiking. Wet and slippery conditions should be expected in the rainforest. From Waikiki, a professional nature guide will shuttle you by van to the lush Manoa Valley. Youll be issued complimentary trail snacks and a water bottle, and optional rain poncho and mosquito spray. Then take a narrated nature 2-mile round trip hike along a jungle stream with mountain pools. Hawaii is home to a variety of plants and trees, some of which, are found nowhere else in the world. At the end of the trail, is a spectacular view of Oahus tallest waterfall (M-F). Youll then hike back thru a bamboo trail viewing the many tropical plants, flowers and trees. Return to Waikiki by van. Guests are urged to wear socks and closed toe shoes with good traction for dirt/mud. Dress comfortable and bring a camera. Following your climb up Koko Head Crater, well have a stop for breakfast on the marina that offers picture perfect views of the crater you just climbed! After breakfast we will visit the nearby Halona Blowhole and Halona Cove, where a refreshing dip in turquoise waters will be much needed! Explore the cove and take in the sites from one of the most famous love scenes in the history of cinema! Youre standing at From Here to Eternity Beach, featured in the famous love scene between Deborah Kerr and Burt Lancaster. This morning adventure will fulfill all your fantasies about Hawaii's lush rainforests, giant ferns, cascading tropical waterfalls, picturesque streams and unique species that can be found nowhere else on Earth. This trail, a hidden treasure that was used by Spielberg while filming "Jurassic Park", leads to the tallest accessible waterfall on Oahu, deep within a prehistoric landscape. Observe Hawaii's rainforest plants and birds as you walk into a wide valley inside the lush Koolau mountains and visit this secluded waterfall. On this educational and fun hike you will learn about the Hawaiian's use of various plant species and the areas interesting environmental history. Excellent photographic opportunities! This hike involve moderate physical activity such as walking over uneven / unpaved surfaces, dirt roads and roots, or occasional mildly steep terrain. This exciting, fun and educational tour of the world famous Diamond Head Crater begins with a short introductory talk by a trained nature guide. Guests learn about the fascinating volcanic creation, Hawaiian history, European discovery, origin of the famous name, early cattle ranching, and modern day military use of the Gibraltar of the Pacific. Before the walk begins, each guest is given one pint of bottled spring water and one energy bar. They are then escorted on a 45 minute walk that ascends to the 763' summit. Along the way visitors stop at several points to rest and photograph the crater. Walking up stairways, going into a dark 200 foot tunnel and climbing a spiral staircase imparts a sense of adventure. When reaching the summit visitors are thrilled by the incredible 360 degrees panoramic views of Waikiki Beach, the emerald green mountains and the sparkling aquamarine water of the Pacific ocean below. Guests enjoy the scenery at the summit for 15 minutes then are slowly escorted back to the crater floor. The excursion lasts 3 hours and is a truly memorable experience. Before leaving, guests learn important information about Hawaiis native bird and plant species and are presented with a Certificate of Achievement, including their name and date of hike, that states they successfully made it to the famous summit of Diamond Head Crater. A personalized "I Climbed Diamond Head" certificate with a photo of the crater that is suitable for framing. Transporation from most Waikiki hotels included. Guests should be capable of walking 0.7 miles mild uphill and climbing stairs. Prices are subject to change and are based on availability for all of the tours listed. Prices may increase during peak travel seasons and holidays. We will ensure that we provide you with the most up-to-date pricing when you are ready to confirm your tour. Prices do not included taxes or fees, unless indicated.